Look at the photograph given below. 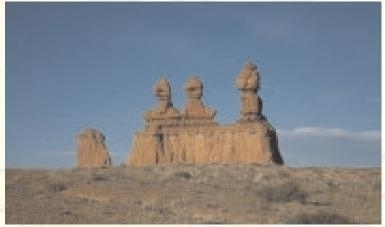 This is The Three Stooges, a bizarre rock formation that can be found in Goblin Valley. There are some exceptionally unique rock formations all over the world. A. Why do you feel such geological structures should be preserved? B. What are the threats to such structures? This question is to be answered on the basis of your own understanding, experience and thoughts. It is strongly recommended that you prepare the solution on your own. However, some pointers for discussion have been provided for your reference. A. (a) These are the ancient structures representing history. (b) They are marvelous structures and add to the beauty of our land. (c) These structures help the anthropologists and historians in understanding of evolution of society. B. (a) The biggest threat to any historical monument is the high aspirations of human race. We have seen this happening when big statues of Buddha in Afghanistan were brought to dust by Taliban. (b) The geographic or to be exact, seismic activity is again a big threat. 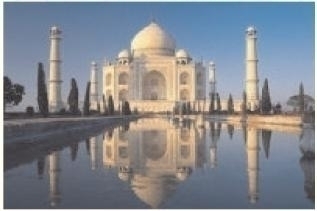 (c) Uneducated and unaware people and even tourists tamper such monuments and structures. We can take example of India where so many locals spit or write on the walls of so many historic monuments. Even the governing authorities stay blind to such degradation. 1. While food production has shown only marginal improvement, the demand for food grains, vegetables and fruits has registered an _________________ growth the world over, forcing governments to initiate urgent measures to establish a balance between supply and demand. 2. To construct the _________________structure, the builder had to use enormous quantities of concrete. 3. When he returned from the office, he _________________ himself in an armchair and asked for a cup of tea. 4. When the teacher saw a student perched _________________on the branch of a tree, she asked him to climb down immediately. 5. The newly appointed office assistant earned the praise of her colleagues for the _________________with which she completed the tasks assigned to her. 6. The new office building was _________________ with its bright and fashionable exterior. 7. The pensioner did not get his dues in time on account of the _________________of the officials. 8. The land _________________ the post office was procured by the authorities for expanding the building that housed it. 9. Merchants stock up on goods during festival seasons to meet the _________________ demand and declare discounts when the sales slacken. 10. During wars armies dig up _________________ passages for the movement of troops and supplies unseen by the enemy. 1. While food production has shown only marginal improvement, the demand for food grains, vegetables and fruits has registered an exponential growth the world over, forcing governments to initiate urgent measures to establish a balance between supply and demand. 2. To construct the mammoth structure, the builder had to use enormous quantities of concrete. 3. When he returned from the office, he ensconced himself in an armchair and asked for a cup of tea. 4. When the teacher saw a student perched precariously on the branch of a tree, she asked him to climb down immediately. 5. The newly appointed office assistant earned the praise of her colleagues for the alacrity with which she completed the tasks assigned to her. 6. The new office building was snazzy with its bright and fashionable exterior. 7. The pensioner did not get his dues in time on account of the apathy of the officials. 8. The land abutting the post office was procured by the authorities for expanding the building that housed it. 9. Merchants stock up on goods during festival seasons to meet the booming demand and declare discounts when the sales slacken. 10. During wars armies dig up subterranean passages for the movement of troops and supplies unseen by the enemy. Threats to the geological heritage. Main Course Book (MCB) - English : CBSE NCERT Exercise Solutions & Summary for Class 10th for Unit-4 Geological Heritage will be available online in PDF book form soon. The solutions are absolutely Free. Soon you will be able to download the solutions.